The story that follows may seem like a solo journey. It reflects, I recognize, a frequent fundamental self-conception by its author of being separate from those around him—of being on a unique path, responding to signals/messages that no one else was attuned to—of having a very personal relationship with the world, especially the land, one that often required shutting out interference from others’ realities. 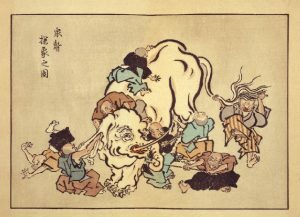 I share it because I suspect that many elements of it are not as unique as I may have believed at the time—that in fact every western individual’s solo struggle is not actually unique at all. We share the same basic human needs, impulses, emotions, challenges—and we’re living in the same time, although in different places and situations. We’re all part of the same elephant, although most of us can’t see it as an elephant. We’re part of community even when we see ourselves as alone or on the peripheries of the communities we identify with; and our communities are part of society even when we feel very separate from it. There is no escape from the elephant we’re all part of. My first intentional community experiences resulted from listening to the voices of the land, not of people. Transitioning from childhood to adulthood, several sudden rude awakenings led me to recognize that, rather than living in a world in which all was well, I was part of an ecocidal civilization which had already inflicted untold damage on the planet and on disadvantaged and earth-based peoples (and even on its own members, who were often both perpetrators and victims of its faulty premises). Having grown up in East Coast suburbia, where that civilization seemed inescapable, and where it seemed impossible not to participate in it were I to stick around, I fled to the hills. Or rather, to the West. I aimed to live as different a life as I could from the one I saw destroying the natural world—to have as little to do as possible with the oppression caused by the western way of life. I left my family of origin and every community of people I’d been part of, and headed to a place where I’d felt strangely at home on several previous visits with my traveling college program: a Native American reservation where I knew no one and no one knew me before my arrival. I felt called by the land, and so certain of this call that I had zero doubt about my path, and even managed to allay my parents’ concerns about it too (with the help of a sometime-counselor who could also tell that this was a place I needed to go). What awaited me was a year-and-a-half’s intimate daily relationship with a remote canyon in northern Arizona, where I found myself in a very close “unintentional community” (the staff, clients, and families associated with a residential center for developmentally disabled tribal members, where I volunteered and worked full-time). 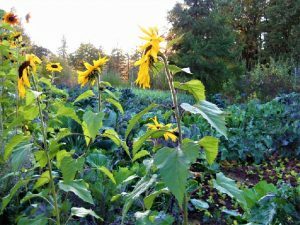 I then followed another unmistakable call—this time, also, not to any known group of people, but to a path of learning about growing food organically. This brought me first into another unintentional community in California and soon enough into an actual intentional community in Oregon—not because I was consciously looking for community (as I saw it, I was looking, foremost, to redeem my relationship to the earth) but because the kind of educational opportunities I was looking for, and the food-growing methods I was interested in, naturally lend themselves to community and in many ways are impossible without it. For the majority of my 20s I slept outside or in a tent in all but the most inclement weather, bought almost nothing new, avoided getting into (let alone owning or driving) cars (and of course, air travel was out of the question), boycotted electronic entertainment and computers, avoided animal products and processed or chemically-grown foods. As I developed intimate relationships with the pieces of land on which I lived (always in some form of community), that land relationship was always the primary, most deeply felt glue that kept me there, rather than the human relationships (although those human relationships certainly impacted how long I wanted to stay or how quickly I wanted to leave). The fact that I could find a situation in which to live so intimately with the land (both in the gardens where I worked most of my waking hours, and in the surrounding woods), with little previous training for that, and few serious economic fears (because I’d never had to confront them before), was undoubtedly a product of privilege that many don’t have. Middle-class white people can embrace voluntary poverty with relatively little risk (or at least relatively little perceived risk) and with minimal obstacles to being received into back-to-the-land experiments. People with less privilege often don’t have the luxury of being “downwardly mobile” with seemingly so little to fear—nor the privilege of being welcomed onto 40- or 80-acre land trusts in which that ecocidal civilization is kept, seemingly, so far at bay. Defining one’s success in life through measures of ecological righteousness and/or land relationships, rather than strength of human relationships, can have its pitfalls. In fact, it can set one up for failure. A conventional American diet, based on factory-farmed animal products,chemically-grown food, excessive processing and packaging: clearly unacceptable. A vegetarian diet which nevertheless includes non-organically-grown or excessively processed or packaged foods: eventually, not acceptable either. A diet which excludes all of the above but still includes non-local and non-seasonal foods (like organic bananas, out-of-season tomatoes from Mexico): still not good enough, after trying it a while. A diet which excludes all of the above but still relies on purchasing some foods rather than growing them oneself: still pretty lame, from a certain perspective. 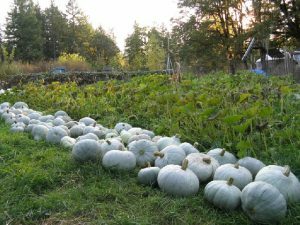 An almost entirely self-sufficient lifestyle, food-wise, growing 95 percent of the community’s own food on its own land—but using fossil fuels: uggh! Growing all of one’s food using only animal and human power: not only extremely demanding, but exploitive of animals and destructive of native ecosystems. 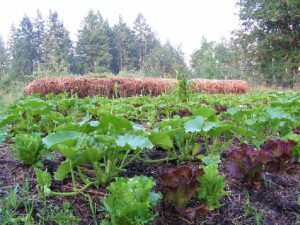 Growing all of one’s food through only our own human labor and the most eco-friendly techniques: why not eat native foods, instead of introduced species that don’t belong on this land? Cultivating native species exclusively: what disruption are we still causing? Wildcrafting exclusively: how are we impacting other species that may be depending on the food we’re harvesting? Becoming breatharian: have we just wasted all the resources that went into keeping us alive thus far? Caught in this trap (the trap of being alive at this point in history), none of us can escape doing something wrong, no matter how much we try to do it right. I found myself never quite living up to my own standards, and perceiving most others as living up to them even less than I was. This was not a formula for “sustainable” community. It is impossible to love or fully accept others when one does not love or fully accept oneself, and vice versa. Basing self-acceptance on full re-attunement to the land (within an impossible situation where our entire world is so far from a balanced human-land relationship, and native foods themselves are in such short supply) is a recipe for misery and disconnection. We (or at least I) worked the land, dawn to dusk, seeking to be welcomed back into its arms. I felt at home in the gardens, in the woods, by the creek, among the birds and other wildlife. I eschewed consumer society and most of what passes for western civilization, for as long as I could. 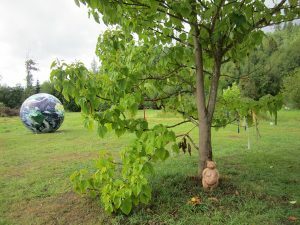 I was sometimes, even often, disappointed that others in my communities were not such gardening maniacs—and yet I also relished the close relationship I developed with the land by being able to hear its voice above all others, by being able to relate to it one-on-one rather than always mediated by human chit-chat. But what we avoid tends to catch up to us. Unexamined and undealt-with personal and interpersonal patterns within my communities sometimes cast a pall over the work I’d felt otherwise so dedicated to—and caused what had seemed like a secure, lifetime “home” to become a place I knew I needed to get away from. What’s more, my fantasy of never aging or tiring physically of this kind of work proved just that. What used to be joyful and easy—or motivating even when it was challenging—became a lot more difficult as my body stopped cooperating as much. Not only had I been privileged by my economic and racial background during those years in the woods escaping the American way of life and trying to model a different one, but by my youth and freedom from health problems or injury. 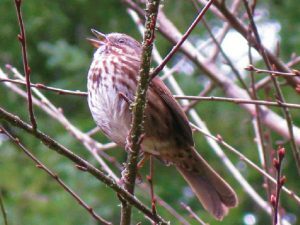 I gradually adapted to new circumstances precipitated by an injury, replacing gardening (after a hiatus while I healed) with an increased focus on birding, which had already become a big part of my life, and by building on an earlier focus on native plants. I became more of a naturalist than a gardener. In nature centers, as I had in gardens, I found a realm in which to escape from civilization and its innumerable discontents. And as with gardening, this escape had a socially responsible aspect to it—instead of teaching gardening and growing food for my community, I was now leading nature walks and teaching people about birdsong. But did I ever tune into the people who’d been gardening apprentices or interns with me, or who’d attended my nature walks or classes, as much as I was tuning into the garden, the land, the plants, the birds? Probably not. I felt my primary allegiance to the natural world, which I was sharing because others were interested. But at the the end of the day, I felt more connected to it than to them. 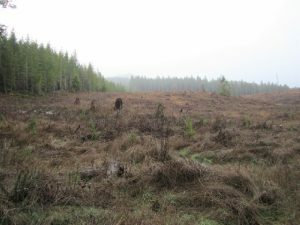 The first clearcuts came as a shock. 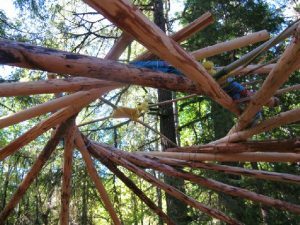 When I arrived in Oregon at my first intentional community, the approach was through a half mile of magical, wooded gravel drive, with logging roads branching off of it into similarly magical forest. (At least these were magical by my standards: I’d never lived in the Pacific Northwest before. They were definitely not old growth; however, a mixed, multi-story forest of any kind held magic for me.) During my time living there (almost six years, spread over an 11-year period) various bits of surrounding forest were chipped away at, but nothing on the immediate periphery. The hike around the watershed became a little less pleasant, but it was mostly still through lush forest, as was our path to the outside world. A few years after my departure, on a return visit after the (human-associated) wounds leading me to separate from that community had healed for me, I experienced a fresh wound: that magical forest through which one used to travel to get to our remote ecotopia was leveled. This was not how the world was supposed to work. It was a tragedy, an unbelievable affront, an attack on the sacred. It was, of course, also business as usual in industrial forestry. 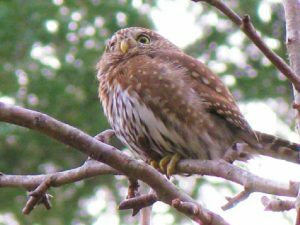 Within a few years, the trees along the quarter-mile-long eastern boundary of the property were also leveled—a shock that awaited me on another visit. Several more clearcuts, on the borders or nearby, were to come in subsequent years. 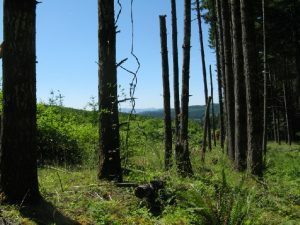 Likewise, my new community, which had watched the seemingly endless woods on its own eastern border come down before I moved there, witnessed the felling of the woods on the opposite border (beyond its own recovering former clearcut, leveled by the previous owners), making the community’s own, 12-year-old trees in the foreground a mighty forest by comparison. These clearcuts too were shocks; they seemed like crimes against nature on so many levels. Again, they were nothing unusual in western Oregon. It was their proximity, affecting forests that we loved, that made the wound so personal for us watching those trees fall. And yet, land recovers. 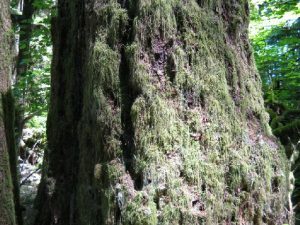 It will take hundreds of years for an ecosystem to achieve old-growth status again—or decades to achieve aged second- or third-growth status again. Some qualities and species may be lost forever. But healing will happen, and does, both for the land and for ourselves, when it’s allowed to. It can even be easy to forget the wounding, the inevitability of more of the same, and the cumulative effect of this kind of activity taking place all over the world, every second of every day. It can be easy to escape back into our little ecotopias, trying to get right with the land, trying to change the world one new resident, a half-dozen new garden apprentices, or a dozen new permaculture students at a time. 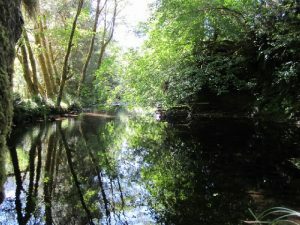 Because being in the natural world can help us to forget previous wounding at the hands of people—to notice instead the forces of regeneration that take over in the absence of continued human assault—a deep bonding with the land can be an effective escape from suffering, both internal and external. We can witness the perfection and beauty of a world left to its own devices, not corralled or stomped out by our civilization. We can get glimpses of the much more intact world that our ancestors evolved in, and which may exist in the future, assuming it survives our own extinction or whatever alternative path our species takes. If we have sufficient privilege and material security, we can immerse ourselves in activities that saturate our consciousness with “nature” (or what we perceive as nature), and push out all those human tragedies we can’t control. We need to be able to ignore the suffering of our fellow humans (at least to some extent) to focus intently on birds, for example—and by focusing intently on birds, we can be sufficiently captivated by another life form that our own apparently deeply flawed species begins to seem less important, especially since it may be beyond redemption anyway. Sufficient personal comfort and security—privilege—makes this possible. What I’ve just described is the path that I, too, was on just a few years ago, despite “voluntary poverty” and a relatively rustic lifestyle. I was able to escape human misery by “finding religion” in the natural world and on the land. And I received support for this (at least moral support, since all of my nature-guiding was volunteer) from others who, for the most part, were also insulated enough from wider social problems that they could fill their Sunday mornings with wanders around a local nature sanctuary, where the world made some kind of sense and retained some kind of beauty, amidst the assault on sense and the senses that mostly surrounds us in 21st century America. As cars whizzed by on the interstate a mile away (cars like those that had brought most of us to this nature sanctuary), and trucks rumbled by spewing diesel exhaust (trucks like those that supplied all of us with much of what we depended on in our daily lives), we listened for bird songs and calls and delighted in identifying them all, while traveling at a tiny fraction of the speed of those vehicles on the highway, focusing on the other-than-human rather than the human, looking for redemption and escape from a more recently emerged world (our present civilization) of which we, like it or not, but often wanting to deny it, were a part. Imagine a nonstop clearcutting operation—chainsaws running all the time. Imagine a television that is on 24 hours a day. Imagine a high-pitched burglar alarm which one cannot turn off. Imagine having any of these suddenly imposed on a world that used to be filled with the sounds of birds, water flowing over rocks, trees swaying and creaking, whispers on the wind, and quiet. Imagine feeling as if one’s naiveté and stupidity caused this unfortunate change inside one’s head. Imagine being unsure if one has been abused by the medical system, taken for a ride for profit, or instead is a deserving victim of his own tendency to trust too much, suspending critical thinking in times of fear. Then throw all the thoughts and analysis out the window, and what remains is this: some wounds do not heal. Some loss cannot be recovered. Some downhill slides cannot be stopped. Or at least that’s how it can seem from within the surgically-induced tinnitus, when one has failed to find an effective remedy, at least on the physical plane. Until three years ago, my understanding of human suffering was severely limited by rarely having experienced it in a serious way. And those experiences which had been especially difficult, which had temporarily sapped my will to live if things were to keep on this way, always resolved into a solution that relieved either (in a few cases) the physical pain or (in others) the emotional pain. The change that happened three years ago, however, has apparently permanently altered the sense I held most dear—hearing—and my relationship to the world moment-to-moment. The resultant emotions/sensations have included overwhelm, disorientation, depression, fatigue, anger, desperation, and despair. All of which, I recognize, I was previously spared by privilege—the privilege of avoiding the kind of misfortune that many people all over the world come to expect, through earlier encounters with it—encounters that seem almost inevitable. As I’ve mentioned before in these pages, no longer can I bliss out to birdsong. No longer can I experience quiet, or anything at all that is not accompanied by this one sensory channel that seems very “off.” On a physical plane, the idea/sense that “all is right with the world” no longer comes to me—not when I’m alone, anyway. The place I had found the most refuge, the most healing, the most escape from the multitude of things that could overwhelm and depress anyone on this planet at this time—the land—is no longer a place I can lose myself and forget about all problems. Instead, it never lets me forget the problems. And maybe, at last, that’s as it should be. Because maybe the idea of escaping to an ecotopian or intact natural world, and thus avoiding the reality of human suffering (my own or anyone else’s) was doomed to collapse of its own weight after all. And maybe I’ve been seeing birds and the meaning to be derived from their presence in our lives through rose-colored binoculars too. The natural world is not a world apart from human problems. The natural world is beset by human problems. It can be easy to forget, while observing a beautiful species and almost wanting to be it, that it may be having a more challenging time dealing with modern civilization than we out-of-place nature-lovers are. We may be blissing out at the escape these birds are providing to us while, at that same time, they are in distress, or will be in the near future. Their nerves may be frayed by the modern world as much as ours are by tinnitus or whatever else plagues us. 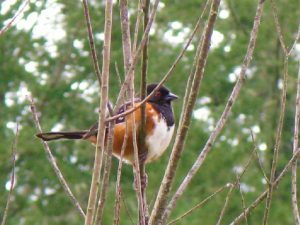 Just as it’s easy to be absorbed by a fantasy happening on a movie screen (created by actors who may in fact be deeply troubled off-screen), it’s easy to admire a migrant bird’s plumage without thinking about the fact that its winter habitat may have just been destroyed to raise more cattle for export. So I experience things differently now. 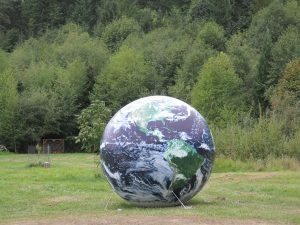 I no longer imagine that, despite what the ecological literature tells us, all is well in the natural world—something my senses would often suggest to me on the basis of the relatively intact ecosystems I was able to put myself into contact with. Instead, I imagine that, in the absence of the silence I can no longer experience, I am hearing the cry of the earth all the time. I can sense that a relationship with the land on the basis of our shared woundedness could be just as powerful as one based on blissed-out “feeling good” in each other’s presence—but I know it will be a long process to integrate what still seems like trauma within the landscape of my own body, and to make peace with it while making peace with the countless traumas affecting our fellow travelers on earth. So what, again, is the upside of all this? Other than perhaps a more mature relationship to the land and all the biodiverse suffering it is holding? It requires surrendering: setting aside my attempts to get perfectly attuned to the land, which have proved futile—as well as my attempts to solve my hearing-related trauma, which have also proved futile so far, at least on a physical level. My own apparently insoluble problems have become boring. Instead, I’ve become fascinated by other people’s problems, and by other people’s needs, and by opportunities to help other people. I’ve recognized that my initial response to trauma—to turn inward and try to nurse my wounds—is exactly the wrong direction to go. Even in my most land-focused phases, I was always nurtured by a sense of social relevance (after all, we were researching, educating, and even producing publications about living more in balance with the earth and one another, at the same time that we were living in community together). With less positive reinforcement coming from transcendently beautiful birdsong, I am no longer attracted to maintaining fierce independence from the roller-coaster world of close, emotionally vulnerable human relationships. Human connection seems to be what I need, the only thing that can truly bring me out of that not-so-happy inner experience described earlier. And fortunately, it is available. What’s more, I find that my consciousness shifts, more and more easily, from myself to others when I put myself in their presence. I find that I get gratification from their experience of a walk through the woods, a beautiful sunset, an experience of healing within the natural world—or the prospect of their finding deep connection with a piece of land. And I am aware, to a degree I think I never truly was before, that everyone experiences formidable challenges in their lives, that adversity is a universal human condition, and that there is no escape. In fact, the only “escape” seems to be recognizing there is no escape, and embracing the universality (rather than isolation) of what we experience. I no longer am constantly dissatisfied with whatever choices I (or, by extension, anyone else) has made in relation to diet or any of the million other areas where we modern civilized humans don’t have a “perfect” choice. I’ve stopped resisting the reality that maybe we can’t do it right. Instead, maybe we are here partly just to experience the irony and the mystery of this time on earth, and respond as best we can in somewhat impossible circumstances. And because I’ve experienced misfortune firsthand that is uninvited, seemingly not deserved (but it is ever? ), or maybe karmically determined (but who knows? ), I finally understand and am no longer inclined to deny misfortune, or to look away when I see it in the outside world, in others’ lives. Instead, I find that my tendency to judgment has greatly abated (except when triggered by presidential speeches), and my capacity for acceptance greatly expanded. And not only acceptance, but love. I find myself feeling in love with a great many people in my life—in ways more dependable than romantic love would be. Maybe it’s because we’re all part of the same elephant. Chris Roth edits Communities. Numerous of his previous articles have touched on some of these topics, hopefully each from a slightly different angle—including “More Sustainable Than Thou” (#115), “How Ecology Led Me to Community” (#143), “Confessions of a Fallen Eco-Warrior” (#161), “Climate Crisis, Dystopia, and Community” (#174), “An Evolution in Community” (#181), and others. ← How will your legacy strengthen community?